This post has been sponsored by Fameelee. 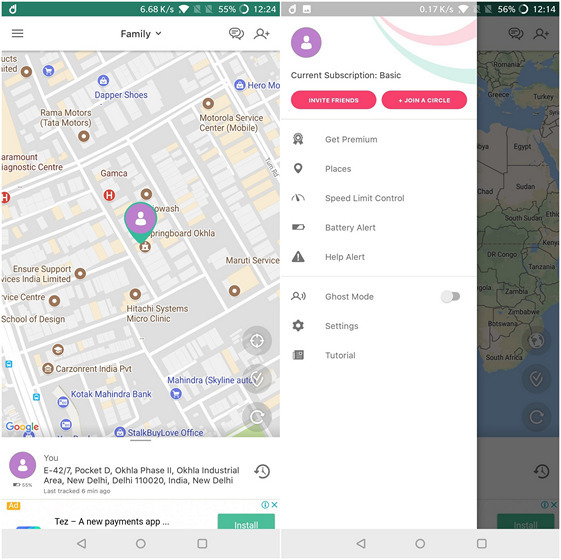 If you are always worried about the safety of your loved ones when they are out and about, the least you can do is install on their phones a family locator app that will help you track their every step so that you will always know if they are where you expect them to be. One of the relatively new names in the segment is Fameelee that is available on both Android and iOS. The app is available as a free download on both platforms, but also has in-app purchase options for some of the more advanced features. So let’s take a look at some of the key features of Fameelee to get a better idea about how it fares when pitted against the competition. 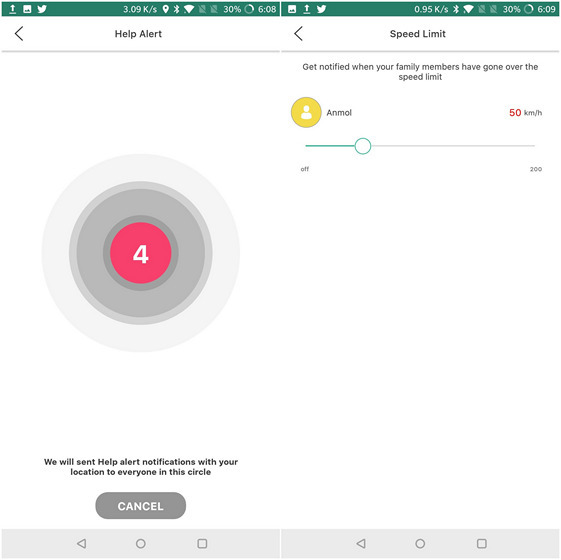 Circle of Trust – You can create groups of family members, friends or colleagues whose movements you can track on your app. Instant Message and Chat – You can send and exchange messages with people in your ‘circle of trust’ and chat in groups. Real-time Location Tracker – GPS tracking functionality provides the exact location of every member in your group in real time. In addition, you have access to their 30-days location history. Places – You will get real-time notifications whenever a tracked device leaves or enters designated restricted zones. Emergency Alerts – The ability to send / receive emergency alerts with your GPS location and video of your surrounding. Phone Locator – Easily track down stolen of lost devices. Speed Limit Control – Get notified if your children exceed the speed limit you consider safe. Battery Alert – Receive notifications if your loved one’s phone is running low on battery. 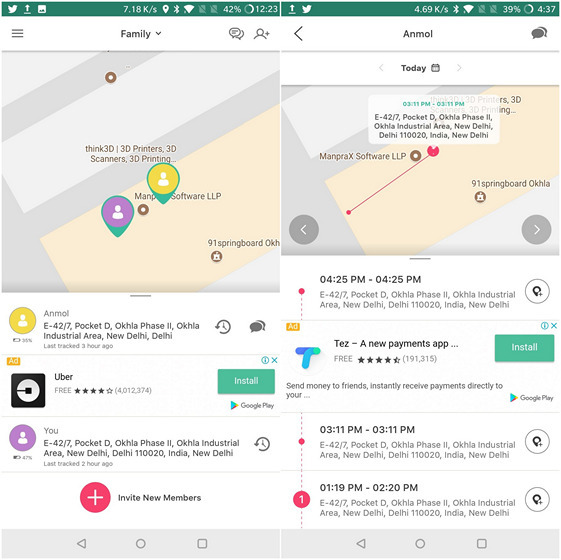 Ghost Mode – One of the cool features of the app, Ghost Mode allows the group admin to track others in their circle without giving out their own location. The app comes with an easy-to-use user interface, which is just as well, given that this app is mostly aimed at not-necessarily-tech-savvy moms and dads who’re worried about the safety of their adolescent kids who’ve just started to leave home on their own or with their friends. As you can see from the screenshots, most of the features are accessible from the slide out panel that can be accessed either through the hamburger menu on the top-left or by swiping in from the left edge. You can tap on ‘Invite Friends’ on your own device to add people to your circle so that you remain the group admin who controls all the options and settings for a given circle. 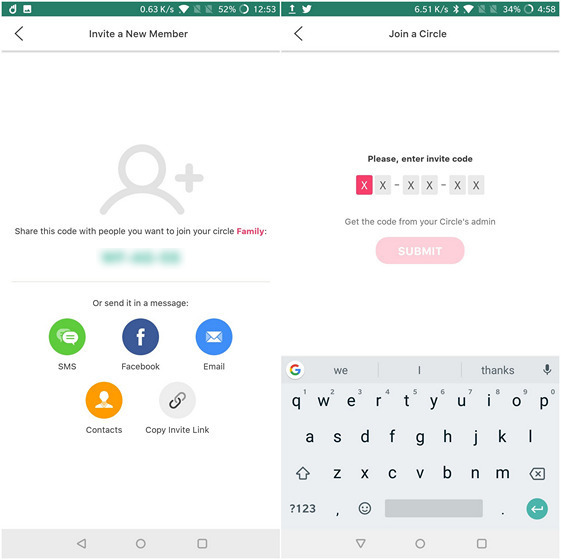 You will see a code that then needs to be used on your kids’ devices that can join your circle by tapping on ‘Join a Circle’ and filling in the code from your app for validation. Once all the accounts are set up, you can track your kids and get a detailed timeline of where they’ve been. In my case, I’m tracking my colleague Anmol (with his permission, of course) for demonstration purposes. On the left screenshot below is where we started in the afternoon, with him sitting just across the hall from me. By 4:37 when I checked his movements, he’d only been to the gate once at 3:11, maybe for a smoking break. 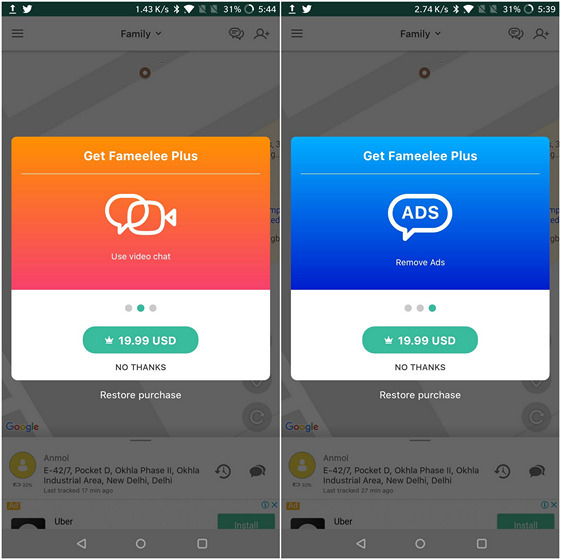 As mentioned already, Fameelee operates on a ‘Freemium’ model, which means the basic features of the app are available for free, but be prepared to see a few full-screen ads from time to time. Some of the more interesting features, however, need to be unlocked with in-app purchases that are pegged at $20. Do note that it’s a subscription-based system that requires you to pay a recurring charge either monthly or yearly. Premium features include unlimited Places, 30-days location history and speed limit control. The premium version also adds video chat and ditches the ads. In case you’re interested in all those bells and whistles, the company is offering a 7-days free trial for you to get started. Family Locator is available on Android and iOS. Do note that you will need devices running Android 4.0.3 Ice Cream Sandwich and newer or iOS 10.0 or later to be able to run the app. Family Locator by Fameelee looks like a competent location identifier service that has great potential. It will keep track of your loved ones so that you always know where they are, it will let you have a chat with them from time to time without having to go into third-party messaging apps and it will also let you hide your own location in case you don’t want them to know that you’re spending a bit too much time at the pub. With an intuitive UI, responsive graphics and thoughtful features, Family Locator by Fameelee is an easy recommendation. After trying several family locator apps over the past couple of years, I’d have to say that Fameelee can certainly go toe-to-toe with any of its more established peers. In fact, the utility of the app is borne out by the impressive 4.2 rating on the Play Store after over half a million downloads. It’s simple to use even for those who are not so tech savvy and you’re also able to track as many people as you want. Sure, it does not have all of the bells and whistles that some of the other locator services offer, but on the positive side, you won’t be overwhelmed by a bunch of additional functions that most people probably aren’t looking for. If you’re searching for a location app, do give this one a go, as it is one of the most hassle-free locator services you can use right now.